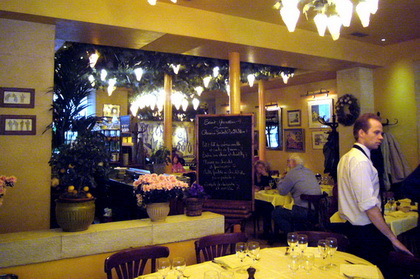 Le Bistro du Dome is one of the many famous restaurant progeny that have become so successful in Paris. The punters who seek glamour go to the parent establishments; those looking for good food at reasonable prices patronize their scions next door. 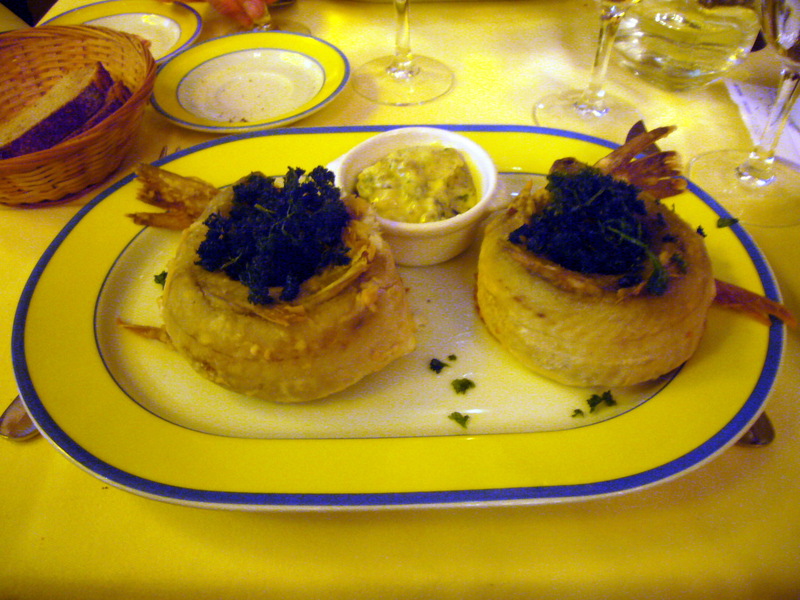 This May we were in Paris on a bargain package tour that put us up in a good hotel just south of the corner of Raspail and Montparnasse, home to Le Dome, La Rotonde and la Coupole, that trio of culinary hemispheres beneath which aspiring American writers sheltered between the wars. 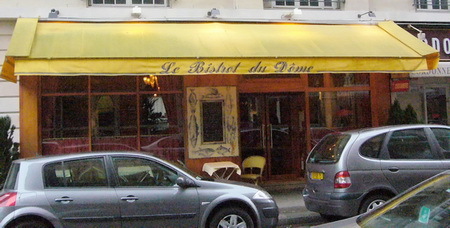 They have all survived as cultural monuments whose facades could be tiled completely with blue plaques. In search of food rather than fashion, we opted for a bistro that had been warmly recommended by old Paris friends. 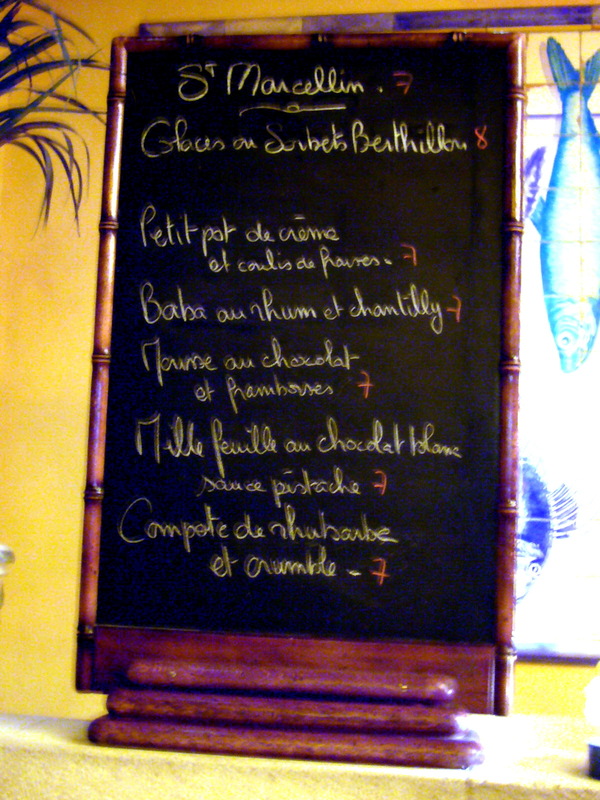 Le Bistro du Dome proved to be a seafood establishment with a constantly changing chalkboard, reflecting whatever the market happened to offer that morning. 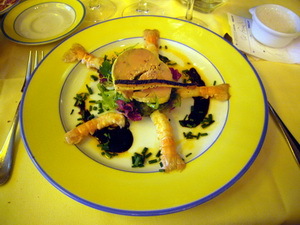 We struck it lucky; not a single course made us wish we had ordered something else. 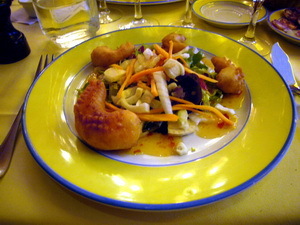 Mary’s first course was Biegnets de crevett es [left], tasty little doughnuts wrapped around prawns and accompanied by a salad with a delicate sweet-and-sour sauce. I started with Salade de langoustines et fois gras [right] , a luxurious combination whose subtle flavours complimented each other. 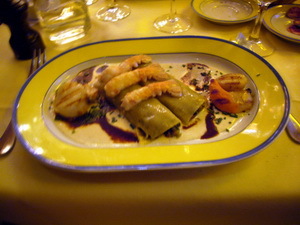 Mary’s main course was Canellonis, St Jacques, langoustines [left], in which the scallops were lightly grilled with the coral still attached. I opted for a cannibalistic Merlan en colére [right]; my fellow-whitings were warmly encased in collars of light pastry. 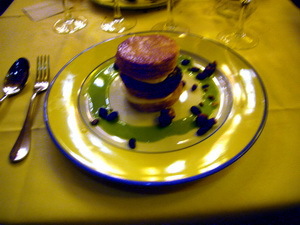 Finally, for dessert, Mary also went the pastry route with Mille feuille au chocolat blanc, sauce pistache [left]; I chose Mousse au chocolat et frombois [right], which was served up in a long tapered glass like an American sunday. It would have done justice to the very best of old-fashioned drug stores. 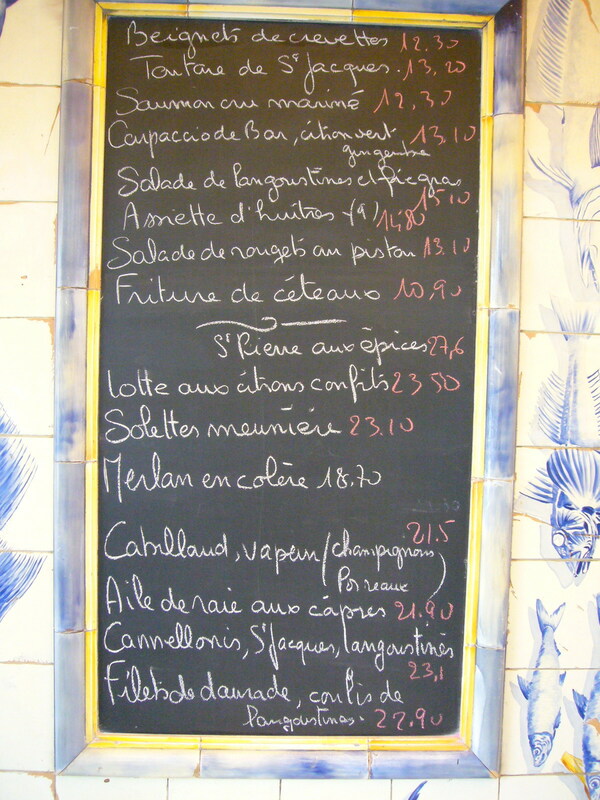 As you can see from les ardoises, our three course a la carte meal came to around 40€ each—not as cheap as an average bistro set meal but of such a high quality that we didn’t begrudge a single centime. 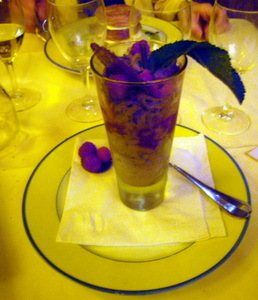 Served up across the street and decorated with a few extra squiggles of coulis, they would probably have come to rather more.